Your next client is out there. We’ll help you find them. The hunt for a new partner, vendor or solution always starts on-line, but not always on your website. Perry & Banks has proven strategies for driving prospects to your website, as well as the talent and skills to populate the site with compelling content. Our goal is to develop a platform that persuades your next client that you have what they need – and start a sales conversation. We use a Hub and Spoke Platform. 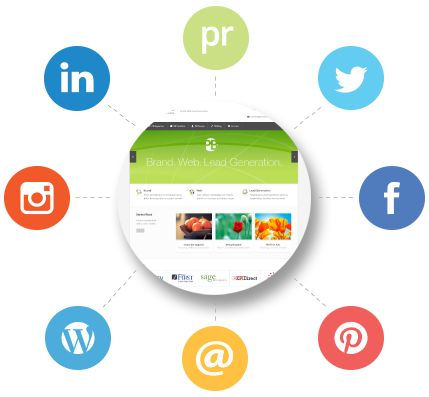 With a dynamic website at the center of your sales and brand strategy, together we’ll determine the best tactics to deliver web traffic. Perry & Banks offers design, content and implementation services for all the tactics listed. We’ll also track, analyze and deliver recommendations for campaign strategies. Looking for a robust market position? Sometimes companies need to refresh and create a new market position for themselves. To compete better. To take advantage of a new market development. To win more business. ’Answer First‘ is a Harvard/MIT developed strategic process that results in actionable items to meet sales and marketing goals.It’s an inclusive process that develops strategies for all departments under one strategic goal. It’s fast and uses focused research to clarify customer attitudes or internal challenges. Results can be achieved in as little as 3-5 meetings. It’s a proven Strategic Process that results in a blueprint to meet B2B Sales and Marketing Goals. • Merge a twelve-division logistics company into three stronger divisions with a more competitive market proposition. • Unify a regional media company and position for today’s news consumer. • Create consensus among several government entities to combine their marketing efforts for more impact. • Develop a unique position and voice for a Fortune 50 transportation company. • Entire team understands their role in success. • Dovetails with professional and company goals and measurements. • Resulting blueprint is a diagram of items to be addressed and/or implemented. Incorporated in 1989, Perry & Banks Strategic Marketing Consulting helps B2B and B2C clients achieve their goals with strategic marketing and communications services focused on increasing sales, accelerating speed-to-market, and generating growth.